Deric's MindBlog: Basal forebrain and default mode network regulation. Basal forebrain and default mode network regulation. 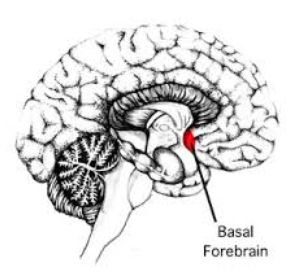 The basal forebrain is an ascending, activating, neuromodulatory system involved in wake–sleep regulation, memory formation, and regulation of sensory information processing. Nair et al. show that it also influences (in mice) the default mode brain network that is active (as in mind wandering) when the brain's attention is not directed externally, as during tasks or exploration. They suggest that basal forebrain nuclei might be target regions for up or down regulation during default mode dysfunction during epilepsy or major depressive disorder. The default mode network (DMN) is a collection of cortical brain regions that is active during states of rest or quiet wakefulness in humans and other mammalian species. A pertinent characteristic of the DMN is a suppression of local field potential gamma activity [~ 40 Hz brain waves] during cognitive task performance as well as during engagement with external sensory stimuli. Conversely, gamma activity is elevated in the DMN during rest. Here, we document that the rat basal forebrain (BF) exhibits the same pattern of responses, namely pronounced gamma oscillations during quiet wakefulness in the home cage and suppression of this activity during active exploration of an unfamiliar environment. We show that gamma oscillations are localized to the BF and that gamma-band activity in the BF has a directional influence on a hub of the rat DMN, the anterior cingulate cortex, during DMN-dominated brain states. The BF is well known as an ascending, activating, neuromodulatory system involved in wake–sleep regulation, memory formation, and regulation of sensory information processing. Our findings suggest a hitherto undocumented role of the BF as a subcortical node of the DMN, which we speculate may be important for switching between internally and externally directed brain states. We discuss potential BF projection circuits that could underlie its role in DMN regulation and highlight that certain BF nuclei may provide potential target regions for up- or down-regulation of DMN activity that might prove useful for treatment of DMN dysfunction in conditions such as epilepsy or major depressive disorder.